VRT, the public broadcaster for the Dutch-speaking part of Belgium, will launch a new TV channel tomorrow, May 1. The new channel, which will be VRT's third, will house children's programming from the morning until 8 p.m. under VRT's children's brand Ketnet. Ketnet currently shares VRT's second TV channel with a channel brand called Canvas, which broadcasts current affairs, culture and entertainment, and this exercise will allow Canvas to extend its schedule to cover the afternoon and early evening. Ketnet only occupies the third channel until 8 p.m., and VRT will use the remaining space for mixed programming including sports and special events as well as programming targeting young people and expat communities. It will all be gathered under the label Op 12, usually linked with established VRT brands. For example, sports will be branded Sporza op 12 and music programmes will be branded MNM op 12 or Studio Brussel op 12 after VRT's radio networks. The Op 12 logo contains a speech balloon with room for the associated brands. Albert Heijn To Go is a Dutch chain of convenience stores, a concept within Albert Heijn, a major supermarket chains in the Netherlands. There are over 50 stores in the "to go" concept, mostly located at places where many people pass by, such as train stations. In March, it premiered a new store design, aimed at enhancing convenince and speed for busy consumers. The new identity was created by the British agency Cada Design Group, who chose to focus on fun by bringing in a range of bright colours. Rancho is a new Romanian brand for meat-based ready-meals in cans from the Romanian food company Scandia Food. The brand was developed by the Romanian agency BrandTailors, who developed a manly identity with Western themes. The logo consists of a belt buckle with a bull's head on it. Carulla is a Colombian supermarket chain that traces its roots back 1905. Today it is a part of the Éxito group and includes about 76 supermarkets. At the beginning of this week Carulla announced a new visual identity which officially launches tomorrow, April 27, in twelve selected stores. Carulla has traditionally used a green oval as its logo, although it was removed a couple of years ago. This redesign reinstates it and introduces a modern script wordmark, where the double-L has been turned into a smile. The Colombian agency Smartbrands were behind the redesign. They wanted to emphasize Carulla's friendly attitude and captivate young audiences with a contemporary and attractive identity. The Swedish Hotel and Restaurant Association (Sveriges Hotell- och Restaurangföretagare, SHR), the employers' organization for hospitality and restaurants in Sweden, changed its name to Visita last Monday, April 23. The name was obviously inspired by the word "visit", which has positive connotations in both Swedish and English. The corporate identity was developed by a Swedish design agency called Innovaform. In an interim period, the name will be flanked by the clarifier "Swedish Hospitality Industry" (or its Swedish equivalent). The Luxembourg Philharmonic Orchestra (OPL, Orchestre philharmonique du Luxembourg in French) was founded in 1933 as the orchestra of RTL, Luxembourg's state broadcaster. When RTL was privatized in the 1990s, the orchestra was turned into a separate institution and adopted its current name. This month it has adopted a new visual identity, created by Justus Oehler of Pentagram in Berlin. He also designed the identity for Philharmonie Luxembourg, the orchestra's concert hall, for its opening in 2005. EastLink is a Canadian cable company and telecommunications provider, founded and based in Nova Scotia. Last week, on April 16, it launched a new corporate identity. The previous identity was introduced in 1998, when Eastlink was formed through a merger. Actimel is a "probiotic" yogurt drink manufactured by the global dairy group Danone and sold in Europe, Latin America and North America (where it is known as DanActive). This month it has introduced a revitalised visual identity in the UK, created by Dragon Rouge in London. Actimel's visual identity differs a bit between markets, but the logo has typically used a purple serifa for 'Acti-' and a blue san-serif for '-mel', with a yellow arch tying them together. The new logo introduces a contemporary typeface and drops the arch for a sunrise icon. A sunrise has previously featured on the Actimel bottles. The National Shipping Company of Saudi Arabia (NSCSA), a major shipping conglomerate, was rebranded last week and as now called Bahri. The new corporate identity, including the name, was developed by The Brand Union Middle East. Pripps Blå is Sweden's largest beer brand, nowadays owned by Carlsberg. Recently, it introduced a new look, designed by the Swedish agency NINE. Originally brewed by Pripps, a brewery founded in 1828, the brand itself was launched in the 1950s under the name Pripps Export. It took the name Pripps Blå in 1975, meaning "Pripp's Blue", based on the colour of its cans. Carlsberg bought the company in the year 2000. The new look takes inspiration from the design used by Pripps Blå in the 70s and 80s, resurrecting the crest that was present on the cans during that time, but updating it to contemporary standards. The design wants to recognise the brand's history, while also communicating anticipation for the future. Nine have also created what it describes as a "tattoo pattern", an extended graphic made to look like an engraving. With the crest at the center, it includes images that refer both to tradition and "dream of the future". It is used on some packaging, and elements of it can also be used separately. Sky Atlantic is a pay TV channel launched in the UK last year, with HBO's extensive library of original productions as the most important part of its schedule. Sky UK's German sister company, Sky Deutschland, will introduce the channel to Germany and Austria on May 23. The name will stay the same, but the identity is designed to fit with Sky Deutschland's other channels. The launch of Sky Atlantic in Germany was announced on March 12, and the logo was unveiled on the same day. The two images below come from two promos for the channel, uploaded by Youtube users StephenMcFox and TVHolidays. The Czech state television company, Česká televize (ČT), unveiled a new corporate identity yesterday, April 19. Czech viewers will see it on their TV screens in September. Since 2007, ČT's channels haven't used the corporate logo in their identities, and management saw a need for a corporate presence on-screen. The existing logo was out-dated, and a previous attempt at creating something completely new hadn't worked out, so the brief was to evolve the existing logo. The new identity was created by the Czech design agency Studio Najbrt, and preserves the screen from ČT's classic logo. Unlike the previous symbol, it is not made up of letters, rather what is described as "abstract shapes" (although they look a lot like parentheses). The new symbol will also be present in the logos of the different channels. The sans serif typeface is apparently custom-made. This rebrand marks the end of Česká televize's classic logo that has been in use for 50 years with incremental changes. It was originally created for the Czechoslovak television company by an allegedly unknown person, a quite clever combination of the initials Č and T to form a television set. An 'S' was added in the 1970s to acknowledge the Slovaks, and removed again once they formed their own republic. The version below is dated 1997 and credited to Lambie-Nairn. Fratelli Orsero (fratelli being Italian for "brothers") is a new Italian premium brand for fresh fruit, launched in January this year. It brings back the name of an old fruit business founded in the 1940s. The brand identity was developed by FutureBrand. The family name should signal commitment to quality, while the retro logo, featuring a small van in black and gold, should remind us of its origins. Germany's second largest private broadcaster, ProSiebenSat.1 Media, offers a selection of pay TV channels to complement its advertising-funded channels, and they are about receive a makeover. At the moment the group offers two pay channels, a classic movie channel called Kabel Eins Classics and a comedy channel named Sat.1 Comedy. In May, the offering will be enhanced with the launch of a third pay channel. The new channel is called ProSieben FUN will offer entertainment for young people. Sat.1 Comedy will be relaunched as Sat.1 Emotions with "heart warming fiction". The company seems to be satisfied with Kabel Eins Classics, which was given a new look last year. Plans for the new channels were unveiled last autumn, and temporary logos came with the announcement. The logos above were published at some point in March. KODA is the copyright collection society for songwriters, composers and publishers in Denmark, the equivalent of ASCAP and BASCA in the US and the UK. Last week, on April 12, it launched a new corporate identity, created by the Danish design agency Kontrapunkt. The new logo consists of a black square, for stability and seriousness, with different colours appearing behind it to symbolise the music. The note symbol from the previous logo has been made smaller and placed after the name. Novosibirskaya is a Russian confectionary factory founded in 1942 in Novosibirsk. Today, it is part of "United Confectioners", Russia's largest confectionary group. Last week, on April 9, it officially adopted a new logo, which is said to be more modern and dynamic. The bear from the previous logo, based on the cyrillic letter Н, has been made somewhat more realistic. The added ribbons symbolise "dynamic business development and forward movement". The international food giant Unilever spent the latter half of the 20th century buying up ice cream companies and expanding to gain a leading role on the worldwide ice cream market. These days, much of the brand and product development has been centralised, and Unilever are usually releasing at least one new product every year across its European markets, usually under its Magnum, Cornetto and Solero brands. This year's new product line is called Magnum Infinity, a chocolate ice cream bar with a coating of dark chocolate. The product logo features an infinity symbol with a full range of colours. Compared to other Magnum packaging, which uses colours associated with the individual producs (mostly brown), the Magnum Infitinity packaging is unusually colourful. UTV Bindass is an Indian entertainment channel targeting the Hindi youth. Yesterday, April 16, the channel was relaunched with a new identity, dropping the "UTV" prefix from its name, while adopting a new "restless" brand philosophy. The letterforms from the previous logo are kept, but can now be used in a more dynamic, less static way, where the letters can move around the "rest-less" device. An agency called Taproot India was behind the repositioning. Bindass is a part of the UTV media group which has several other TV channels and was recently acquired by The Walt Disney Company. TNT (which once stood for Turner Network Television) is one one of the most watched cable TV networks in the United States, usually being one of the ten most watched cable networks in primetime. It has a heavy emphasis on drama and some sports, and has been marketed with the tagline "We Know Drama" for the last eleven years. In the last month, TNT has slowly rolled out a new marketing platform, which includes a new logo with focus on the word "drama". It seems promos with the new branding started running in March, with a full launch in April. It appears the new "Drama" logo will not entirely replace the previous circular logo, rather they will support each other. But the fact that TNT has moved its website from tnt.tv to tntdrama.com suggests this branding is intended to be permanent. Another part of the new branding is a new visual language, dominated by text in the same typeface as the logo on a simple black bakground. In May last year, the French pay TV broadcaster Canal+ relaunched most of its wide range of thematic TV channels, bringing them together by added a "plus" to their names and giving them similar logos. Some of the channels owned by Canal+ were unaffected by this rebrand, but two of them followed suit this month. On April 5, the group's cooking and home-styling channels, previously known as Cuisine.tv and Télé Maison, became Cuisine+ and Maison+. For more visuals, I refer you to the French TV design blog Lenodal, where you'll find an extensive entry on the subject. The new identities were developed by Canal+' in-house team. Screenvision is a major U.S. cinema advertising company, delivering pre-movie advertising to over 14,000 screens. Recently, it introduced a new advertising pre-show called "The Limelight" involving a mobile app called "screenfanz", which Screenvision humbly describes as "redefining the movie-going experience". Along with that came a new brand identity. The new colors are taken from the name of the pre-show, and the 'S' icon can be divided into two parts that can be used as visual devices. The new brand strategy was devised by Lee Heffernan, Screenvision's marketing VP, and Lee Hunt, who ran a prominent broadcast design studio in the 1990s. New York studio Loyalkaspar are said to have brought their vision to life, which probably means they devised the new motion graphics, and perhaps the logo as well. March was a busy month with several noteworthy rebrands. Here's around 40 of them. If there's something I've forgotten, don't hesitate to tell me. 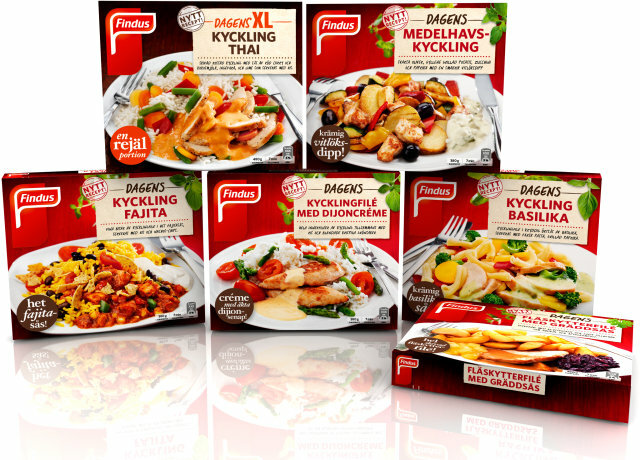 The frozen food maker Findus has gathered its ready-meals on the Swedish market under the sub-brand Findus Dagens (rougly meaning "Findus Today's"). Along with the new name, the packaging has been refreshed and the product itself has been refined with improved recipes. The new brand and package design was created by Stockholm design agency Pond. Some examples of the new packaging can be seen below. Malabar Gold is an Indian jewellery brand with retails outlets in India and the Middle East. It plans to expand rapidly in the next few years, and last month it unveiled a new corporate identity that should help make that expansion a success. The new identity was created by The Brand Union Middle East and launched at an event in the United Arab Emirates on March 25. KDU–ČSL is a minor political party in the Czech Republic. Those six letters are an abbreviation of Křesťanská a demokratická unie – Československá strana lidová, which translates as "Christian and Democratic Union – Czechoslovak People's Party", hinting at the party's Christian democratic ideology. In March, it unveiled a new party symbol, a stylized lime leaf that represents the party's "relationship to traditions, bond with the land, the countryside and the homeland" (my translation). It should be noted that neither the symbol nor the wordmark are new. The wordmark has been used as party logo for a few years, and the leaf has been used as an election symbol at some point. But this rebrand seems to make the leaf a permanent part of the logo and settles on a single colour scheme. Interstate Hotels & Resorts is an American hotel management company that manages nearly 400 hotels around the world, although most of them are located in the United States. In March, it launched a new corporate identity that was created "to better communicate the Company’s position as the only large-scale, U.S.-based hotel management company with a global footprint". Deli Reform is a German margarine brand, manufactured by a local company called Walter Rau Lebensmittelwerke, a somewhat unusual example of a major margarine brand that isn't controlled by a multinational. Recently, Deli Reform refreshed its logo and packaging. Deli Reform was introduced in the late 1950s and was originally sold in cubes with blue and red packaging. The red shape from the original packaging has been with the product with incremental updates since the beginning. Some decades ago a bunch of grains, fruits and a sunflower were added to the logo. This latest update is another such incremental change, making the word "Reform" smaller and altering the red shape slightly. The packaging employs recent advances in printing to make room for more buttercups. Destination America is not yet another tourism marketing campaign. It is an upcoming TV network. Planet Green, a U.S. TV channel from Discovery Networks dedicated to eco-friendly living, is due to be closed down next month. In its place, Discovery will launch a network called Destination America, "the first network to celebrate the people, places, and stories of the United States", which essentially means lifestyle and exploration programming with American themes. The rebrand was announced yesterday, April 4, and the logo above came with the announcement. Destination America launches May 28. Colorado Springs, the second largest city in Colorado, unveiled a new logo on Monday, April 2. The logo was developed by a local design firm called Fixer Creative on the behalf on a "Community Branding Task Force", headed by the convention and visitors bureau. The task force had unveiled a new logo back in November, developed through focus groups and research. It also included a new tagline, "Live it up! ", a reference to the city's high altitude and big plans. But the logo was (rightly) rejected by the community, and the protests caused the task force to announce a new logo process the following month. The new symbol combines the C symbol from Colorado's state flag with the Pikes Peak, located near the city. The "Live it up!" slogan is no longer a permanent part of the logo, rather it is a "temporary marketing slogan". The symbol is supported by fresh and very contemporary typography, using both Pragmatica Slabserif and Verlag. Beckers is a Swedish paint manufacturer, tracing its roots back to 1865, when a German opened a paint shop in Stockholm. For several decades, it has used a rainbow as its logo. At the beginning of April it was given a careful refresh. One colour (orange) has been removed, and the ones that remain are livelier. The name has been put below the rainbow, and the outlines have been removed. The new logo was reportedly created by Swedish design agency BVD. Beckers claims the previous logo hadn't changed since 1967. About a month ago, the Swedish state broadcaster SVT introduced new looks across four of its TV channels. The new graphics packages were commissioned from the New York agency Trollbäck + Company. Last week, Trollbäck posted montages of their work for SVT1, SVT2 and Kunskapskanalen, and they provided enough visuals to warrant a new post. SVT1 employs a full range of bright colours and a 3D version of its logo. The more serious and specialist SVT2 uses orange and blue, exploiting the curves in the two numeral. The docuentary and information channel Kunskapskanalen also uses a full colour range, but with less bright tones. Prague Zoo, the zoo in the Czech capital, unveiled a new logo last weekend as it inaugurated the zoo's 81th season since its foundation in 1931. It was created by Chermayeff & Geismar in New York and features footprints of five animals: an amphibian, a reptile, a bird and two mammals - one carnivore and one herbivore. Before lanching the pitch that led to Chermayeff & Geismar being commissioned, the zoo had tried to find a new logo through logo contests that generated unsatisfacory results. The need to get a new logo arose from a legal dispute with the designer behind the previous logo. In the last few years, the zoo has used an interim logo. Unitymedia is one of Germany's major cable companies, owned by Liberty Global who are also behind major cablecos in several other European companies, most of them using the UPC brand. Last Friday, March 30, Unitymedia unveiled a new corporate identity that adopts the symbol used by Liberty Global's UPC brand, but gives it more colour and depth. RTP Internacional is the international channel Portugal's state broadcaster RTP, broadcasting a selection of RTP's domestic programmes to all populated continents except Africa. 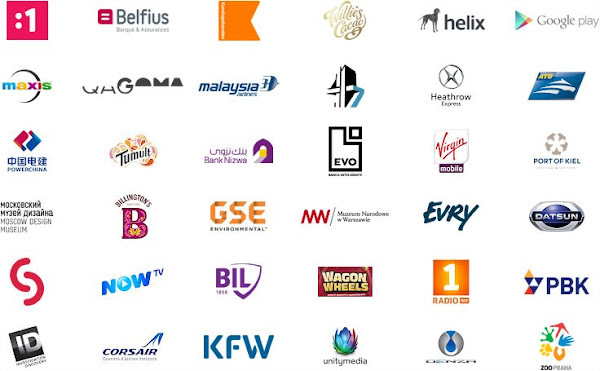 RTP are slowly implementing a new branding scheme that gives its TV channels new logos based on the corporate logo. RTP International followed last week, introducing a new logo with a stylized version of the Portuguese flag.